It is thought that a majority of the galaxies in the universe have a massive black hole in the galactic center. Since these black holes have masses of several millions to tens of billions of solar masses, they are called "supermassive black holes (SMBHs)". Recent observation results suggest the correlation between the SMBH mass and the central bulge mass/luminosity of the host galaxy. Such correlation indicates that SMBHs may have played a key role in the growth and evolution of galaxies. 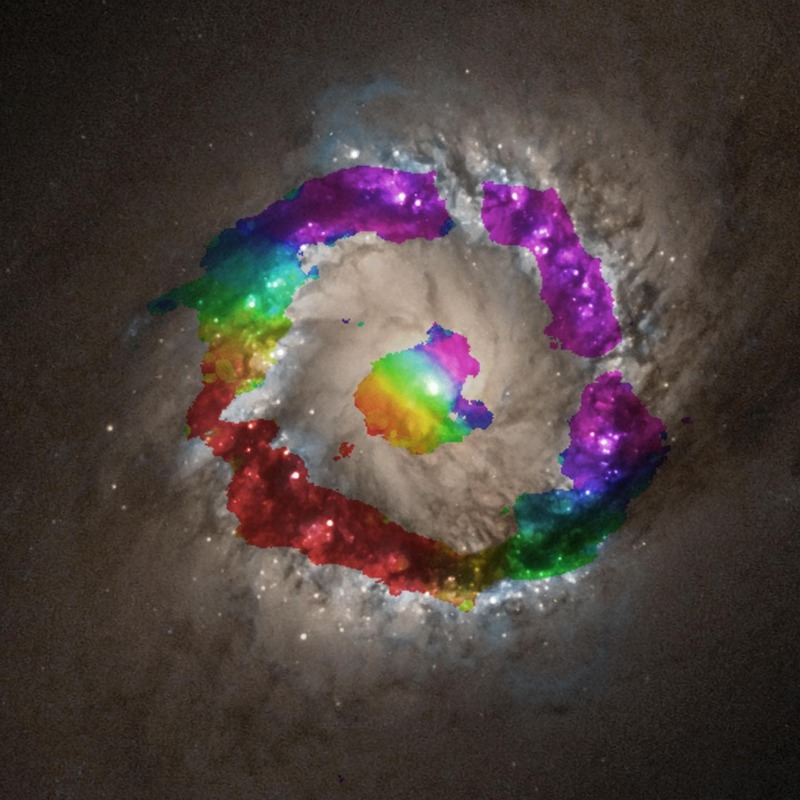 An international research team observed the barred spiral galaxy NGC 1097 with ALMA and found that the central supermassive black hole (SMBH) has a mass 140 million times the mass of the Sun. Since galaxies are believed to have co-evolved with SMBHs, SMBH mass is an important parameter in understanding their relation in the context of galaxy evolution. This research result is based on the ALMA observation data obtained within a two-hour observation, which demonstrates the outstanding capacity of ALMA in the SMBH mass measurement. The image above shows the central region of NGC 1097 observed with ALMA. The velocity of the HCN gas is shown in the color and overlaid on the optical image taken by the Hubble Space Telescope. Red indicates gas is moving away from us while purple is coming closer to us. SMBH mass is an essential parameter to reveal the correlation between the SMBH and the host galaxy. There are several methods to derive the SMBH mass, one of which is using proper motion of stars and megamasers (astrophysical objects that emit strong radio waves) around the SMBH to estimate the gravity of the SMBH applied to the observed objects. This measurement method, however, is difficult and not suitable for the most galaxies because it requires observations of the regions around the SMBH with very high angular resolution (*1 and *2). Another method is using ionized gas dynamics distributed in the host galaxy bulge. Ionized gas, however, is easily affected by non-circular motion such as inflow or outflow of gas, in addition to the gravity of the SMBH. This makes it difficult to accurately measure SMBH mass for a large number of galaxies. The method most commonly used to estimate SMBH mass is the one using stellar dynamics in host galaxies, although its application is rather limited to elliptical galaxies and thus it won't be a versatile SMBH mass measurement method applicable to wide ranging types of galaxies. An alternative to these conventional methods is to derive the SMBH mass from molecular gas dynamics in the central region of a galaxy, which was formulated by Davis et al. at the European Southern Observatory (ESO). This method has the advantage that molecular gas is less susceptible to environmental conditions compared to stars and ionized gas, and therefore the motion affected by SMBH gravity can be measured more easily. Davis et al. made observations of a galaxy NGC 4526 for tens of hours with a radio telescope called CARMA and estimated the mass of the central SMBH. A research team led by Kyoko Onishi, a doctoral student at the SOKENDAI (The Graduate University for Advanced Studies) doing her research at the National Astronomical Observatory of Japan (NAOJ), took on a challenge to derive the mass of the SMBH in the central region of the galaxy NGC 1097 (*3) using ALMA observation data. ALMA's high sensitivity enables the team to measure gas velocity with high accuracy. "While NGC 4526, observed by a team led by Davis, is a lenticular galaxy, NGC 1097 is a barred spiral galaxy. Recent observation results indicate the relationship between SMBH mass and host galaxy properties varies depending on the type of galaxies, which makes it more important to derive accurate SMBH masses in various types of galaxies," Onishi said. The research team made precise measurement of the distribution and kinematics of molecular gas by observing emission lines from hydrogen cyanide (HCN) and formyl cation (HCO+) with ALMA, and then examined the gravitational motion of the molecular gas by making some astrophysical models. Since the gravity applied to the molecular gas differs depending on the SMBH mass as well as the density and distribution of stars in the bulge, the gas motion was calculated by making models assuming various cases in order to find a model which is best fitted for the observation data. As a result of the calculation, it was found that the central SMBH of NGC1097 has a mass 140 million times the solar mass. This is the first SMBH mass measurement using this method in late-type galaxies (e.g. spiral and barred spiral galaxies). Onishi said, expressing her expectations for future ALMA observations, "We could obtain the kinematics data of the central molecular gas in NGC 1097 within a two-hour ALMA observation. To reveal the relation between the SMBH and the host galaxy, we need to derive more SMBH masses in various types of galaxies. ALMA will enable us to observe a large number of galaxies in a practical length of time." Measuring the mass of SMBHs is the first step to solving the long-standing mysteries about how galaxies and SMBHs have been formed and co-evolved. This research assures ALMA's capability in this field.